Invisalign is a series of clear, plastic aligners that can straighten the teeth over a period of time. Invisalign can correct a variety of existing malocclusions, including crooked or misaligned teeth, teeth that are spaced too far apart, cross bite, overbite, under bite, and it can also simply improve aesthetics. Patients are required to wear the aligners for 22 out of the 24 hours in a day. You will only remove the aligners to eat and clean the teeth. The aligners are very thin and comfortable and can be used as whitening trays as you straighten! A consultation to determine if you are a good candidate for Invisalign and a conversation defining your treatment goals will be needed. If you are indeed a good candidate, the Invisalign process is initialized with diagnostics. Upper and lower impressions, photographs, existing current radiographs, and a C/R or bite registration along with an online script will be created by Dr. Emirzian. This information is then sent to an Invisalign lab, and they will then review the information and set up a Clincheck or three-dimensional movie showing how your teeth will move over time. At this point, we will be able to answer questions like how many aligners will be needed, over what period of time will you be in treatment, and if any specific modifications will be made to your teeth. A patient can see the end result of their Invisalign treatment through the Clincheck. If both doctor and patient agree that the end result looks good, we will accept treatment online, and the lab will begin manufacturing the actual aligners, which will be shipped within two weeks! A misalignment of the teeth can lead to serious periodontal (gum) problems if left untreated over a long period of time. It is more difficult to clean overlapped teeth and flossing can be very tight. This can create periodontal pockets, irritated, unhealthy tissue, and areas that bleed constantly. A person’s occlusion or bite can become uncomfortable as the teeth shift out of alignment, causing the eventual loss of teeth. Having straight, properly aligned teeth will help to maintain a healthier oral environment. While Invisalign treats all sorts of malocclusions, the aesthetic benefits are the most rewarding. When Invisalign is initially placed, things will feel different in the mouth as you will be wearing an aligner. Some patients’ speech is affected, but only during the first few hours of having the aligners in, as the mouth is a highly adaptable place. With every new aligner, there can be a “nagging” type of discomfort that goes away within an hour as each new tray will place pressure in different areas of the mouth, encouraging tooth movement. 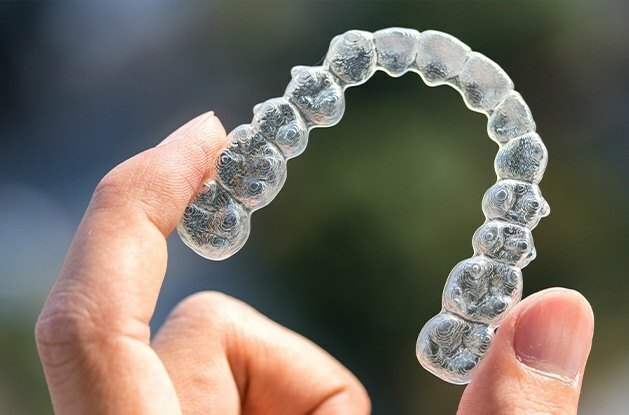 What else should I know about Invisalign? There is absolutely no down time needed after getting Invisalign, as the majority of treatment is done on your own at home, switching aligners. You will be required to see Dr. Emirzian at least every 3-4 weeks as your changing teeth positions must be monitored closely. The length of each individual Invisalign treatment will be determined after viewing the Clincheck. Typical treatment times range from six months to one year for average cases, however, some cases can take up to two years. The cost of Invisalign will be based on the length and complexity of your treatment and will be reviewed prior to your acceptance. Not everyone will have dental insurance for Invisalign; it requires a specific type of coverage. Our talented administrative insurance specialist will be able to determine if your insurance will cover part of your Invisalign treatment.